Liam Harrold scored twice for Coates against Leverington before the game was abandoned. Leverington were labelled a ‘total embarrassment’ after their Peterborough League Premier Division game at league leaders Coates Athletic was abandoned after 80 minutes yesterday (January 31). Referee Stewart Francis had no option but to halt the game at Feldale Field after Leverington were reduced to six players by two red cards and three apparent injuries. The laws of the game don’t allow a match to continue when one side has fewer than seven players. Coates boss Andy Lodge accused Leverington of trying to stop the game by unfair means. He was frustrated as his side would have gone three points clear at the top and with a healthy boost to their goal difference. Lodge, who claims he contemplated quitting the local football scene as a result of what he had witnessed, said: “It was a farce. They had a player sent off early on, picked up one very bad injury and then two soft ones. They thought the game was going to be called off then, but when they realised they had to lose one more player, one of them just started swearing at the referee until the inevitable happened. “Some of their players were a total embarrassment to their club. They were not hiding what they were up to. I know a few of the lads who used to play for Leverington and they would never have allowed this to happen. It was dreadful to watch and I feel for my lads as they had played well. “It’s a blow to us as we would have gone clear at the top and we would have had a serious boost to our goal difference. We probably would have scored a dozen if the game had carried on. “I don’t understand why they behaved like they did. Thay had an issue with the same referee earlier in the season and they were using that as an excuse, but we did nothing to provoke them. Coates are likely to be awarded the game, but any punishment for Leverington will depend on the referee’s report. 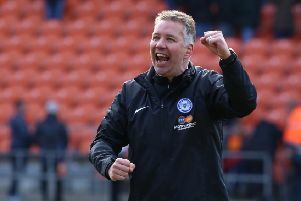 The match was watched by Peterborough League representative Darren Fogg, the recently-appointed manager of the competition’s League XI. Leverington have already accumulated in the region of £500 of fines this season and earlier in the campaign they had 10 points deducted for fielding a suspended player under an assumed name. Referee Francis sent three Leverington players off during a Premier Division match at Deeping Rangers Reserves in October. 7 minutes: Leverington captain Darren Rawthorn was dismissed for foul and abusive language towards an official. Leverington down to 10 men. 45 minutes: Leverington leave an injured player in the dressing room at half-time. They have already used their substitute. Leverington down to nine men. 55 minutes: A Leverington player suffers a serious knee injury. Leverington down to eight men. 75 minutes: A Leverington player claims to have suffered a hamstring injury and leaves the field. Leverington down to seven men. 80 minutes: Leverington player Nathan Watson is dismissed for foul and abusive language towards an official and the game is abandoned as Leverington are down to six men. As things stand Coates stay level with Oakham on points at the top of the table. They are one goal better off on goal difference. It’s looking like a two-horse race for the title as third-placed Netherton United suffered a second successive defeat yesterday. Moulton Harrox beat the city lads 1-0 with a goal midway through the second-half from Matthew Barnett and Netherton’s woes were multiplied by an injury to player-boss Jon Harrison who has a suspected ruptured thigh muscle. ICA Sports toppled Netherton the previous week, but were on the wrong end of a shock result yesterday as they went down 3-1 at Uppingham. Jake Wilson scored ICA’s consolation goal in the final moments. Liam Littlefair (2) and Michael Simpson scored the goals as Sawtry beat bottom club Crowland 3-1 in the only other top flight match to beat the weather. (Abandoned after 80 minutes as Leverington were reduced to six players). Moulton Harrox 1 (Barnett), Netherton United 0. Uppingham 3 (D. Dumford, Binley, Thomas), ICA Sports 1 (Wilson).